First and foremost, what do Hockney and Vincent Van Gogh really have in common, aside from citizenship in the brotherhood of man, sometime landscapists and extraordinary colourists? It might be the stickler, stodgy art historian in me but the “deep, intense longing felt by both artists throughout their careers for new vistas and new worlds” means, to me, not much. 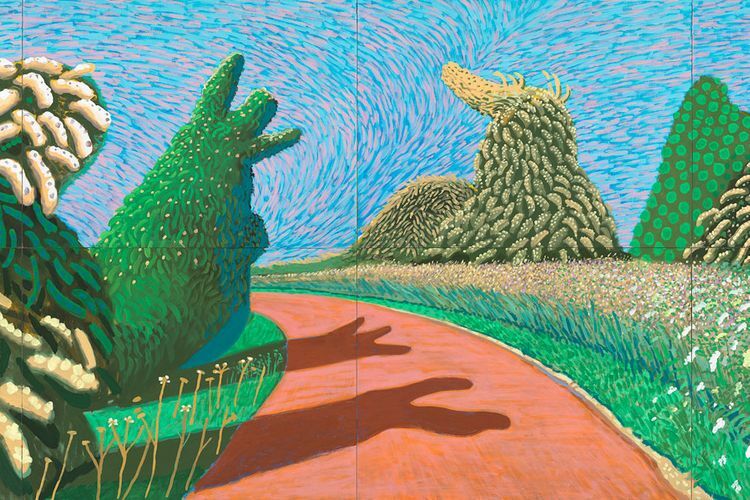 Hockney was inspired by Van Gogh to paint outdoors, “just to find a new kind of language…and I tried to create new space”. Van Gogh savoured “that flat landscape in which there was nothing but…the infinite…eternity.” That’s the catalogue’s take (ellipses not mine). The catalogue and show are filled with bromides. It’s a lot of baby talk.